I'm sure like most of you, I find that the eve of the New Year is always a time to reflect on the challenges and accomplishes of the year before. I usually do make a list of resolutions each year, wither I actually stick to them or not. I just find that it helps me to clear away the old and prepare to focus on the new. This year I am not going to do that. I know this year is going to start off slow and then skyrocket with the arrival of our new baby in February. 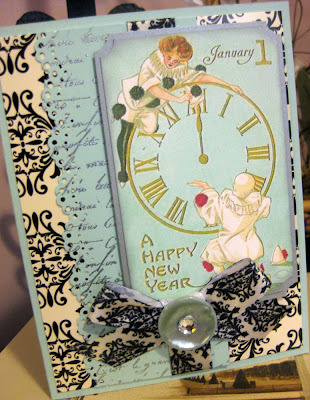 The one thing that is a guarantee for the new year is that it will be an exciting and hectic one. I am preparing to set aside my own needs and focus entirely on my family. 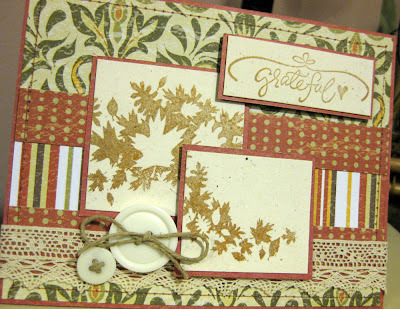 That's just what I have to do right now, even if it means that I will not have any time for creating cards or blogging--those things will always be there in the near future. 2009 was the year of being tired--yes, I hate to sound negative--but that is how I will always remember the close of this decade. Not that all of us mom's are not tired all of the time, I'm just resolved that that is one of the characteristics of the job. This year was a bit more tiring for me as I started it out working as a substitute teacher, a part time job but a very stressful one at that. We survived an entire kitchen re-modeling project that turned our house on it's head for four months. And now as the year ends my pregnancy is slowing me down more and more as my husband works faster and faster to get a new bathroom installed before the arrival of the baby. I hope I don't sound like I'm complaining--each one of those things, although tiring, are real blessings. But if I could make one resolution for this year it would be to take care of myself a bit more--focus on my own health and overall well being. Another luxurious fantasy in the life of every mom. 2009 was also a year of discoveries. My little guy makes them every day as he grows and matures into the person he will one day be--I get to experience all of those new discoveries right along with him. I also discovered my own artistic style and a real sense of satisfaction as an artist--a life time goal that I'm so pleased I finally had the chance to experience. Although I am very uncertain about where my art will take me in 2010 I know I will always cherish the time I did have to create my cards and to share them with everyone. 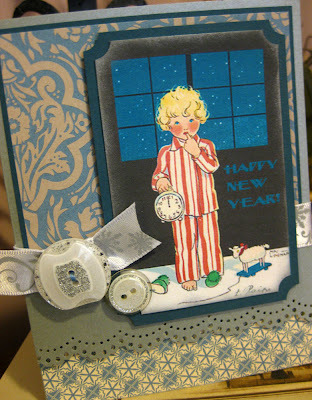 Recently I re-created a card celebrating the New Year that I made last year. 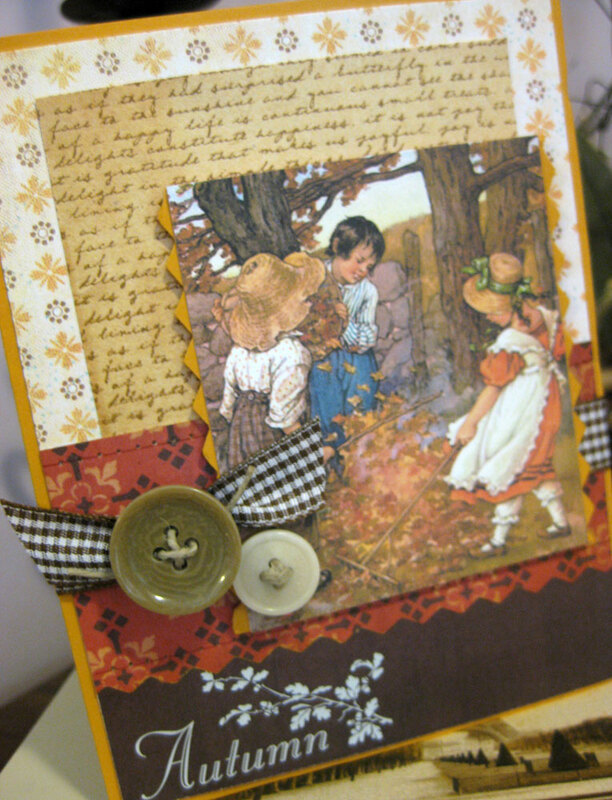 The first image is one of the very first cards I created as I started this journey of discovery. The second image is the card I recently made using the same sentiment and stamped image. It's a real testament to me of how my own style has grown and developed over the last year. 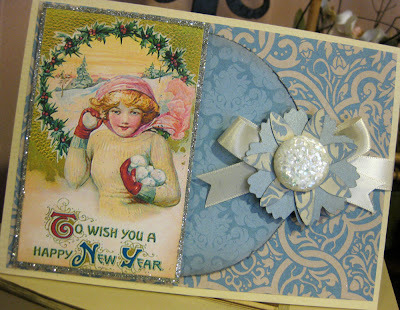 Well, thanks for all of your support and comments here on my blog and for tolerating my new years ponderings. Wishing everyone a very happy 2010; may you find satisfaction as you reflect on the previous year and success in achieving those that you set for yourself for the year ahead--never stop growing. 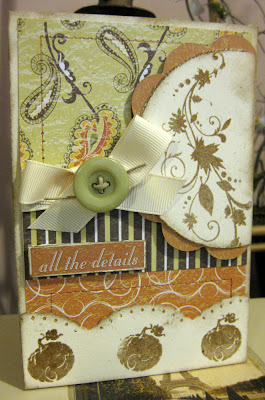 I thought it would be fun to play along with the Moxie Fab World Blog's Tuesday trigger for this week. 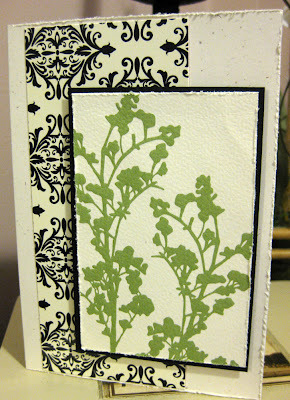 Here's a simple card featuring a damask patterned strip and a bit of green flowers. Every once in a while I like to keep it simple. 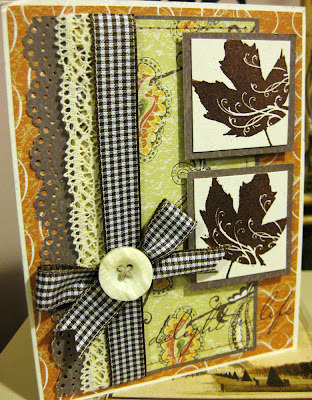 What was really fun about this card is that I used all non-paper crafting products to make it. 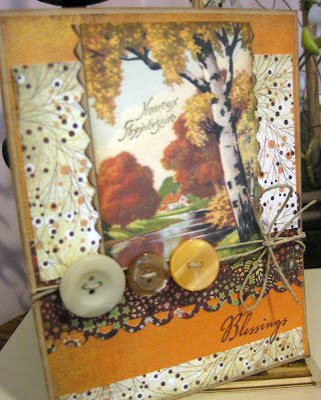 I love taking things that might not necessarily be made for crafting and create something new with them. 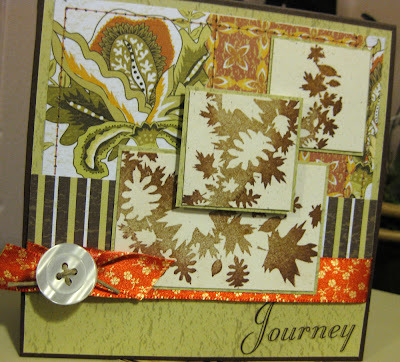 The damask patterned strip is from a pack of file folders that I found in the dollar bin at Michael's and the letter pressed green flowers where actually an image from the invitation to the engagement party. The second card is a bit more complex--going back to my usual cluttered and shabby style. 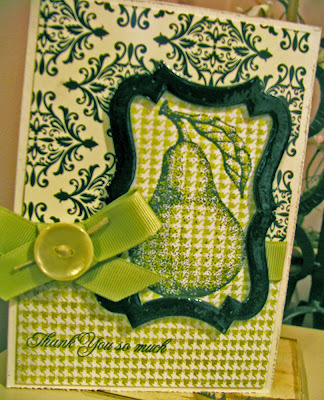 I've been wanting to use this pear stamp image for awhile and thought this was a perfect project for it. Unfortunately, the picture isn't the best. My digital camera died on me last night, I was so sad. Luckily it is still under warranty, but just until the end of this month--it was a Christmas present last year. I sent it back to Canon today and am keeping my fingers crossed that they will fix it for me. In the mean while I am forced to use our older camera, which isn't ideal. I feel really lost without my camera. 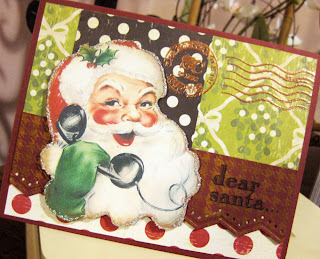 Just a quick post today to wish everyone a happy holiday! Although this has been an exceptionally hectic December, and my pregnancy really slowed me down, I did enjoy myself and the moments I shared with friends and family. 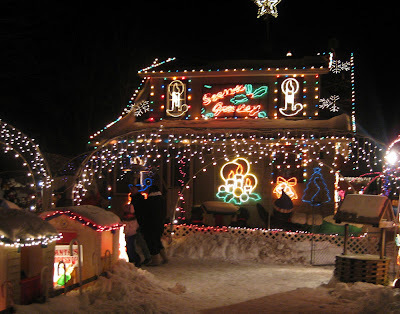 Last night after dinner my hubby, little guy and myself ventured out in the cold to visit a local holiday sight, which we affectionately call "the Christmas house". 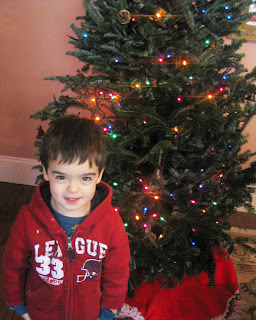 Our little guy loved it--and it was a great way to start off our holiday celebrations. 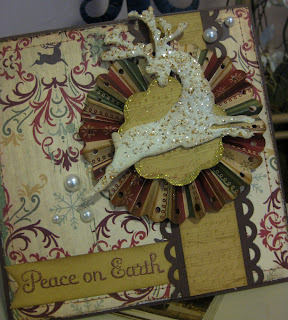 Also, I have been enjoying all of my holiday crafting. 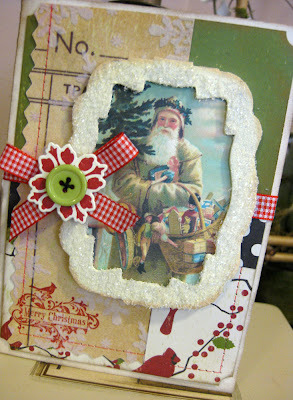 I am especially pleased with this set of vintage inspired Santa cards that I just finished up. 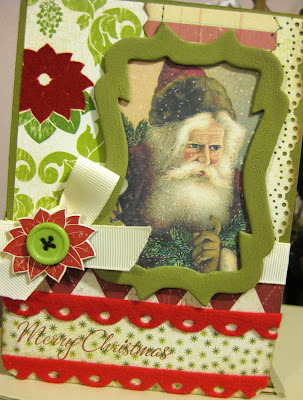 I used papers from Making Memories most recent Christmas collection to make these cards, which is such a fun one. 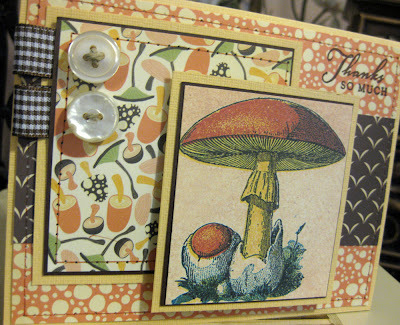 I love the traditional colors and fun patterns they chose for the papers. Wow-what a day we had yesterday! My little guy and myself were party hoping all afternoon. We started in the afternoon with my little guy's pre-school party. I was one of the class mom's for that so I got to stay and help for the entire party. 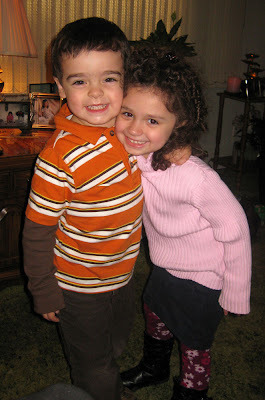 It was my first chance to see how my little guy interacts with his teachers and fellow class mates. He was so happy to see me in his class room he introduced me to all his friends, "that's my mommy!" It was one of those moments that all of us mom's live for. I put together a special gift for each of my little guy's teachers. Just a little note pad folio with a special sentiment and a matching pen. They were fun to make and didn't take too much time to do. 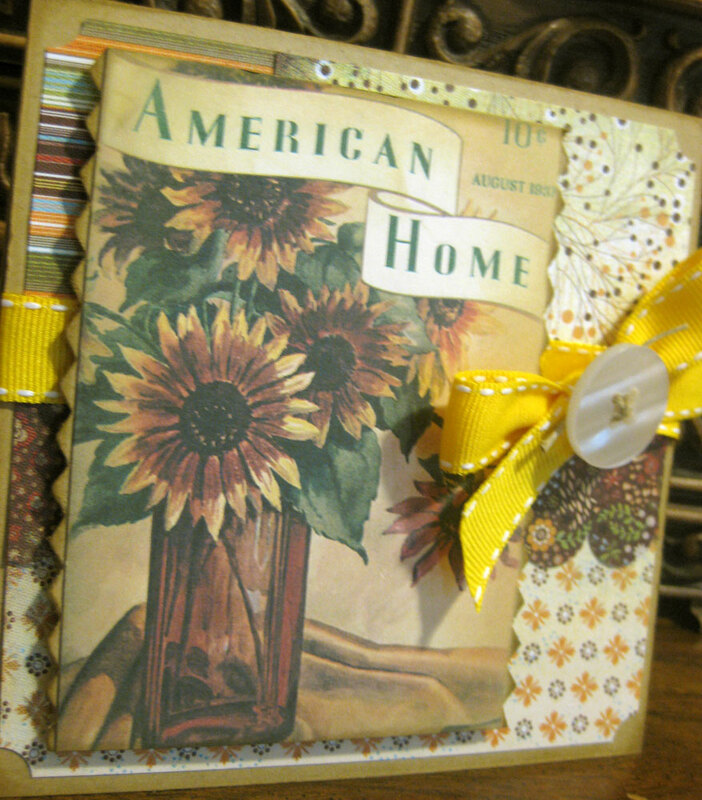 Hopefully, I'll get a chance to make a few more to list in my Etsy shop soon. After wrapping up his school holiday party we headed over to our Mom's club party. By this time my little guy was all jacked up on sugar and had not had a nap, so needless to say I was on major meltdown watch. 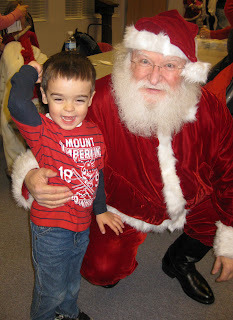 My little guy was over the moon when Santa made an appearance at the party. He went up to Santa for at least three hugs and then even sat on his lap to tell him once again what he wants for Christmas. 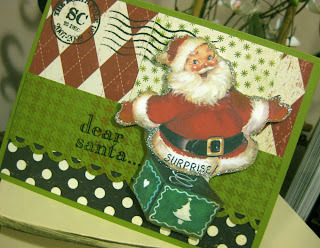 After Santa left he turned to me and said, " Oh no, I forgot to give Santa a big hug and a kiss by by." Can't blame the kid, Santa is irresistible. Well, only two more days until the big day. I hope everyone finds some time to relax and enjoy the season. 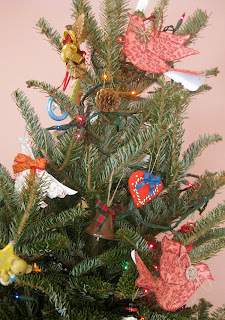 I'm off to bake gingerbread cookies and cupcakes today-- and then finally, I think I will be able to relax. Saturday morning-5am, not a drop of snow in sight. Well, just to be on the safe side I decide to run over to Kohl's to return something and to buy my little guy a pair of gloves, the one essential piece of snow gear I had left to pick up--just in case. By the time I make it to Kohl's and Shoprite (6am) and then back home again by 7:15 the snow was already coming down and sticking--this was certainly going to be a big one! 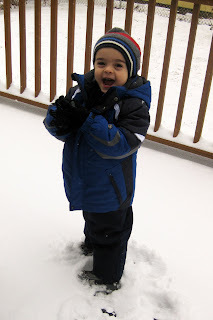 Although our plans to take the little guy on a Santa train ride had to be cancelled, he was more than delighted to stay home and play in the snow. 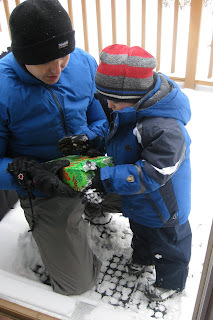 My hubby took him outside to help him build his first snowman. 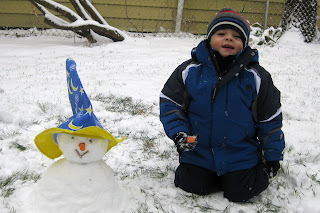 It had to be a tiny one because the snow wasn't sticky enough, but he still loved it! Santa decided to make an early stop at our house to deliver the perfect present for a snowy day, a new sled! 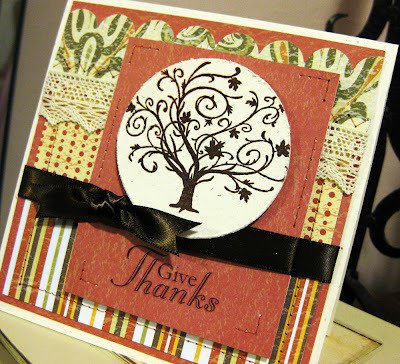 I hope everyone enjoyed their day and took the opportunity to get some things done at home or to just relax. 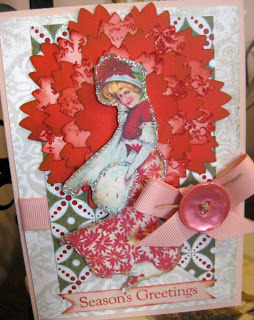 I have one more Christmas card to share with you and then I'm off to start my day. 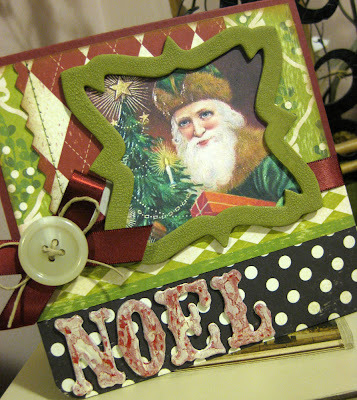 Wow--I can't believe it's just 8 days until Christmas! 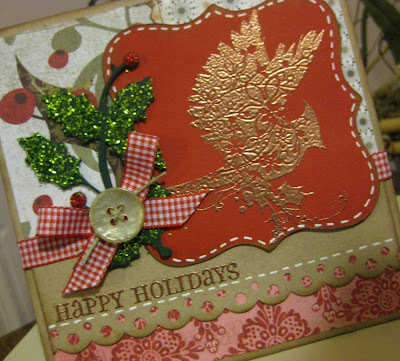 Well, I am officially done with my Christmas shopping, finally got my Christmas cards out--late, but better than never and I only have two presents left to wrap. Now I just have to make it through Dec. 22nd when I'm one of the class mom's for my son's Christmas party and then directly after that we're heading to the Mom's Club Christmas party. Should be a fun day, but when your 7 months pregnant it's also quite exhausting. I know my little guy will have a blast though, so it makes it all worth it. I had a pleasant surprise the other morning when I received a blog award from my good friend Melissa (A.K.A Kathia) from Pink Little Cake. Melissa is an amazing and creative baker and not only are we blog friends, but we've been friends in real life for quite a long time now. I'm so fortunate to have her and her daughter in our lives--my little guy is crazy about her cutie pie daughter too and they play so well together. When you have a chance take a peek at the beautiful Pirate themed Birthday cake she made for my son's 3rd Birthday party. I hope everyone is enjoying this holiday season. Although this time of year can be hectic and crazy, it is still such a special time to enjoy with friends and family--so try not to loose sight of that. 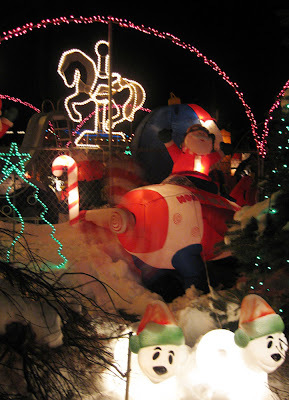 Yes, I definitely have to agree that the holiday season is the best time of the year, although it is a crazy and hectic one as well. 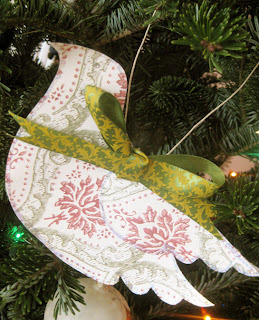 When it comes to holiday crafting I find that I have been obsessed with winter birds. It all started with cardinals. I just love their majestic red feathers and especially how their vibrant color contrasts against the bare winter landscape. They are one of natures most stunning ornaments. 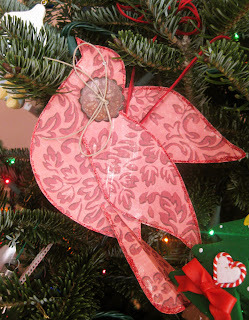 This fixation with winter birds actually started last year when I created two sets of paper birds to decorate my Christmas tree. 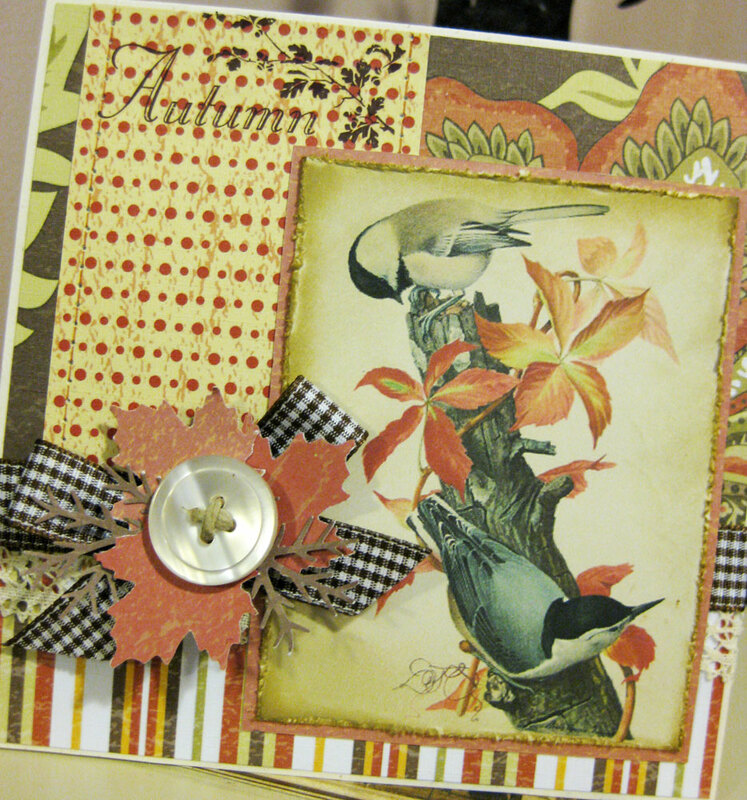 This year I decided to create a whole series of Christmas cards based on my love of these birds and my fascination with the natural and rustic elements of the season. 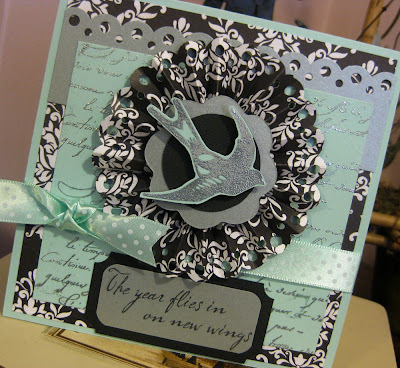 I used a winter birds stamp set from Inkadinkado along with card stock from Paper trey Ink and patterned papers from Basic grey to create these cards. 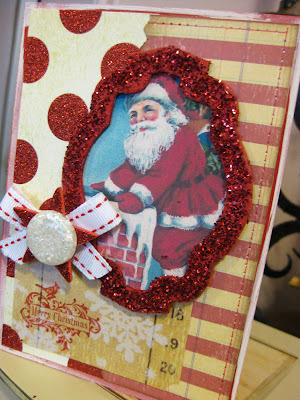 Stop by the Moxie Fab World Blog to see some other fabulous card projects that have been inspired by festive little critters.